Many things follow a “power law” distribution (sometimes also called the Pareto principle or 80/20 rule), where a small fraction of the available resources in a system are held by relatively few members of that system. In particular, power laws seem to apply to the concentration of wealth. While this is speculative, if there is wealth concentration in the bitcoin economy, it may follow other similar wealth concentration models. For this analysis, we used the “Wealth, Income, Power” model from the University of California at Santa Cruz. As of today, there are about 12,052,250 bitcoin in circulation, according to Blockchain. 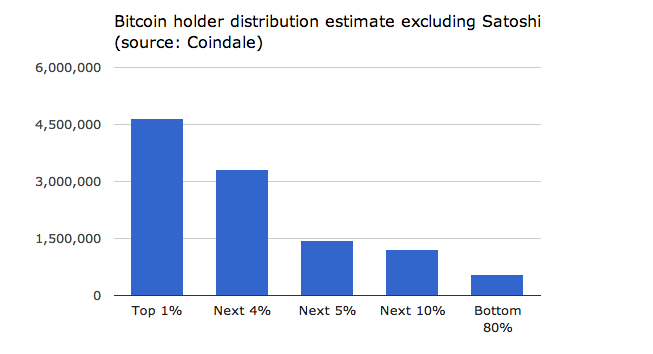 Using the UCSC model, as of December, 2013, the distribution of bitcoin would look like the following. Here is the spreadsheet used to generate the bitcoin power law graph. Has anyone seen anything to contradict the belief that bitcoin would behave in this manner?